9 1/4 stanchion post 2 1/4 dia Size: 9.25"HDescription: Taper stanchion post, for conversion to "bun..
Adj table pedstl 14.5 -30.75 Post: 2-7/8" Dia.Base: 9" Dia.Size: 14-1/2" - 30-3/4".. 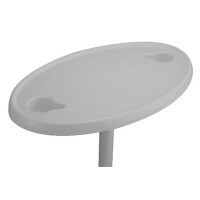 Oval Top (75320): Acrylic-coated ABS plastic with 2 recessed cup holders.Rectangular Top (75321): AB..
Thermofused, white melamine top is permanently bonded on both sides. Edge is finished with molded se..
Table ped flush mt ribbed Size: 2-7/8" x 30"..
Table ped surface mt ribbed Size: 30" H overallDescription: 3 pc. Set, Surface mount base.. 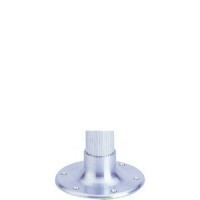 Surface mt taper socket base Size: 7" Dia.Description: Taper socket base only, surface mount..
Deluxe table pedestal w/top Size: 28" L x 15" W x 30" H..
Chrome plated brass with black plastic knob. Screw size is 8. Angle width is 1". 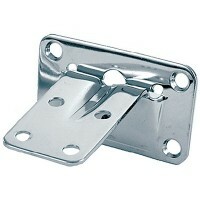 Angle length is 1-3..
Chrome plated brass. For removable tables. 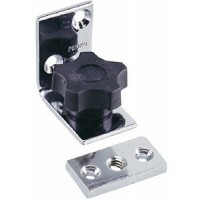 Two brackets and two wall plates per card. Bracket: 2-3/4..